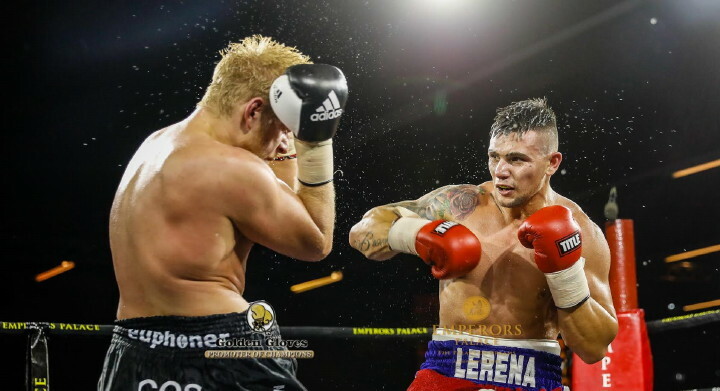 Kevin Lerena (21-1, 9 KOs) says he is fully focused on Artur Mann (15-0, 8 KOs) as ‘The KO Kid’ puts his IBO World Cruiserweight title on the line against the German challenger on Saturday at the Emperors Palace in Johannesburg. Lerena claimed the IBO strap with a split decision over Youri Kayembre Kalenga in September 2017, before successfully defending his belt with unanimous points wins against Dmytro Kucher and Roman Golovashchenko. Heading into his third defence, the 26 year-old insists he is leaving nothing to chance, and admits he has even been waking up thinking about his opponent. “I know everybody is talking about Oleksandr Usyk moving up to heavyweight, and what’s going to happen to his belts, but to be honest, I don’t really care,” said Lerena. “My only focus is this fight. I wake up and think of Artur Mann. “I know I need to take care of business against him. He’s 15-0, he’s coming off a very credible record, and he has my full attention. This is a big fight for me. Yes, on paper, I’ve had big fights before, Kalenga, Kucher, Golovashchenko, Nielsen, but these are in the past, and I need to focus on what’s in front of me. Lerena’s coach Peter Smith, of Smith’s Gym, echoes his fighter’s sentiments, and states they will not be taking the Hannover-boxer lightly. Lerena-Mann is a co-promotion between Team Sauerland and South Africa’s premier promoter Golden Gloves, led by Rodney Berman, who describes Saturday’s match-up as one of the country’s ‘biggest cruiserweight fights ever’. Artur ‘Thunder’ Mann (15-0, 8 KOs) has arrived in South Africa ready to realise his World title dream as he challenges Kevin Lerena (21-1, 9 KOs) for the IBO Cruiserweight crown on Saturday at the Emperors Palace in Johannesburg. The 28 year-old Hannover-hotshot is full of confidence as he enters his first World title contest following convincing wins over teak-tough Russian Alexey Zubov and the previously undefeated Alexander Peil in his last two bouts. Having added legendary Cuban coach Pedro Diaz to his training team, Mann believes everything is in place for a memorable victory as he goes behind enemy lines in an attempt to dethrone the Johannesburg-native. “First of all, I would like to thank my promoter Team Sauerland, and Golden Gloves, for this great opportunity,” said Mann. “My dream has always been to box for World titles, but I never thought it would happen so quickly. “I’m excited and extremely motivated to challenge Kevin Lerena for the IBO belt here in South Africa. I know Lerena is a tough opponent, but there are no easy fights at this level, and I wouldn’t be here if I didn’t think I could win. The IBO World Cruiserweight title showdown between Kevin Lerena and Artur Mann is a co-promotion between Team Sauerland and Golden Gloves. German boxing fans can watch all the action from the Emperors Palace live on Sport1. “This is the moment I’ve been working my whole life for,” says Mann. “Who would have thought a year ago that today we would be preparing for an IBO World title fight in Johannesburg. I can’t thank my promoter Team Sauerland and the Sauerland family enough that this dream could be realized so quickly. Thanks also to my management Daniel Todorovic and Marius Schulze.